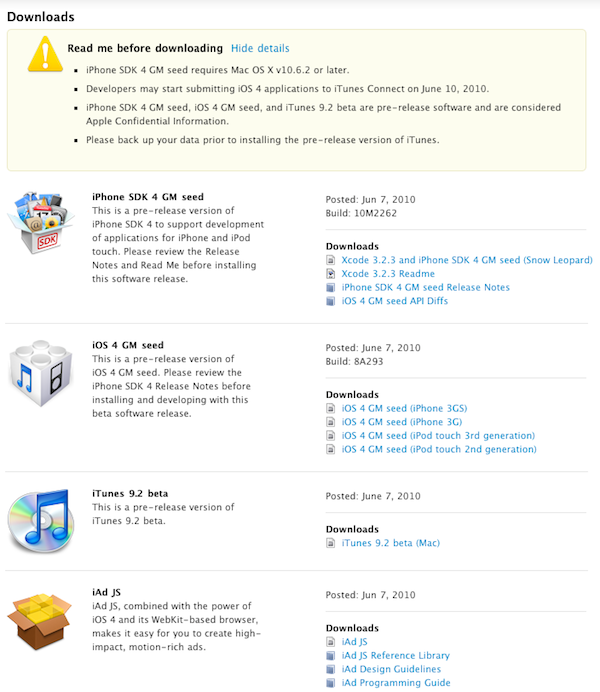 As promised by Steve Jobs earlier today during his WWDC keynote presentation and iPhone 4 announcement, developers now have access to the iOS 4 GM Seed, iPhone SDK 4 GM seed, iAd JS, and iTunes 9.2 beta. Accompanying the new dev releases is a new 37-page license agreement that I’m sure we will be hearing more about soon. Developers can head over to the Apple iPhone Dev Center. Full descriptions from Apple below for those non-devs that want to take a look. Apple also released Safari 5 today on top of a number of new announcements including the new iPhone 4, a number of updates on the iBook store, HTML5 support, and the newly named iOS 4.